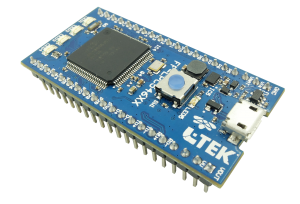 The L-Tek FF-LPC546xx is a small, 40-pin development board intended for prototyping general microcontroller applications. It is based on a low-power, peripheral-rich and debug capable NXP LPC54606 microcontroller enhanced with the power-efficient 220 MHz ARM® Cortex®-M4 core, with integrated DAPLink interface for a complete debugging experience. The latest in the series of mbed Microcontrollers, it supports Ethernet, USB, and the flexibility of numerous peripheral interfaces and FLASH memory (external 32-Mbit SPI serial Flash memory onboard). Conveniently integrated with a DAPLink programming/debug interface and packaged as a small 40-pin 0.1” DIP, this platform can be used to prototype applications using a wide range of IO boards and peripherals supported by mbed in the mbed Component library, such as mbed Application Board. You can find useful examples here. You may purchase FF-LPC546xx here.